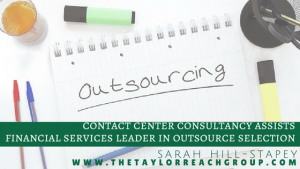 "Contact Center Consultancy Assists Financial Services Leader in Outsource Selection" is lockedContact Center Consultancy Assists Financial Services Leader in Outsource Selection | The Taylor Reach Group Inc. Customer Experience and Contact Center consultancy, The Taylor Reach Group Inc., (TRG) today announced that they will be assisting their client with Outsource Vendor Selection initiative. 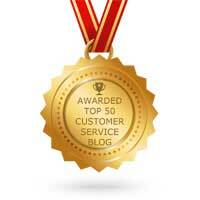 The client, a financial services leader, will dramatically reduce the risks associated with contact center outsourcing. Through stakeholder interviews, and meetings with the client, TRG gains a thorough understanding of the current state of the operation and can assess the Contact Center maturity in the four primary elements of contact center operations: People, Process, Technology, and Methodology. TRG limits project scope creep and slippage through weekly written reports and check in calls. The outsource selection process incorporates detailed assessment of requirements, vendor capabilities, vendor approach, project management, pricing, locations, reputation and communications cadence. TRG will work to define requirements, identify candidate firms, develop the RFX, develop scoring and evaluation methodology, issue RFX, manage vendor inquiries and support short-list and finalist determination and subsequent negotiations. Established in 2003, TRG, is vendor agnostic has provided consulting advice to thousands of Contact Center of all sizes, across all verticals. TRG has seven offices globally and each TRG consultant possesses a minimum of 20 year of Contact Center operational management experience.